Special Effects hairdye is a semi-permanent, conditioning hair color that comes in a wide spectrum of colors. They are non-animal tested. Professionals and non-professionals alike are using Special Effects dye to get the bright long-lasting results they need. The photos below are what Special Effects hair dye looks like in the bottle. Your results may vary, we highly recommend prebleaching for the most stunning end effect. The darker your hair and the more vibrant color you want to attain the lighter your hair will need to be before applying. Special Effects hair dye is just $14.00 each. 1 bottle contains 4 oz of dye, the thicker and longer the hair, the more you'll need. Special Effects recommends not lathering on liberally but using 'just enough' to coat each strand. looks lavender in the bottle this is great to take yellow tones out of bleached hair.You must already have your hair at 'inner lemon rind' yellow for this or any other semi-perm toner to be able to neutralize the yellow. Sparks powder lightener, mix with the developer below. L'Oreal Quick Blue powder lightener lifts your hair up approximately 7 levels. For the professionals who demand a high quality hair bleach! 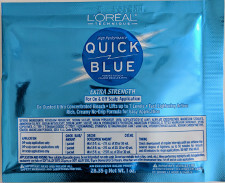 L'Oreal Quick Blue Powder lightener bleach pack. Mix with developer to get your perfect pre-dye bleached / blonde hue! 1oz 'single serving' (so to speak) size. For professional use only. L'Oreal Oreor developers to mix wiht your Quick Blue Powder Lightener powder bleach. For professional use only. L'Oreal Oreor 30 volume developer 16oz bottle. The most popular volume to use, so we carry the larger size for you. 16oz. Dy-Zoff hair color remover lotion is specially formulated to get stubborn hair dye stains off your skin. You want the dye on your hair, not your neck, ears, hands, face! 12 oz applicator bottle. Don't use your kitchen bowls for your hair dye or bleach! /handstapleforehead This clear tint / dye / bleach bowl has measurement markers, for precise measuring of your developer and dye. Clear so you can see what's going on and make sure you get it clean before your next dye/bleach adventure. Large Tint brush. The width of the bristles is 2.25 inches. Available singly or in a package of 1 dozen. $9 per dozen package 3-in-one tint brush. Part with the long tail, comb where you're going to apply, apply color with the brush, and repeat. 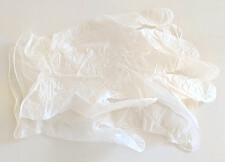 Long Nitrile gloves, these go over your wrists to keep your wrists/arms cleaner when tinting long hair. $1.30 per pair Clear processing cap to use for your semi-perm dye or bleach. Highlighting/Frosting cap You put the cap on, and you poke holes in it. You pull the strands of hairs through and... Bleach them! Dye them! This makes highlighting hair without getting it all over your non-highlighty hair a *lot* easier $1.70 each. Highlighting hook / Frosting hook Very handy for spearing and pulling through exactly the strands of hair you want to bleach / frost / highlight / dye. $1.70 each. 4oz easy squeezy applicator bottle. For precision application of bleach or dye. We now have a Semi-Perm Hair Dye FAQ with the most frequent questions we get about semi-perm dyes, and our answers. Read this first before Emailing us with questions, it's a good chance your question is answered here.